Cancellation before one day which is no chargeable. We provide you full rajasthani thali which is include all types of cultural food only in 200/- rs per person. The Royal Heritage Guest House, Jodhpur welcomes you to the Blue walled city and awaits you to offer its warm and friendly hospitality. Located in the lovely and ancient Clock Tower Area, Royal Heritage enjoys a commanding position in the culture, sightseeing, shopping hub of Jodhpur. Set 2 Km from the excitement of the city, the hostel commands an excellent location and provides access to the city's biggest attractions. For the comfort and convenience of guests, the hostel offers transfers to the airport, bus and rail stations, all of which are located no more than 5 km from the hostel. The Royal Heritage Guest House, Jodhpur welcomes you to the Blue walled city and awaits you to offer its warm and friendly hospitality. Located at the foot of Mehrangarh fort in the oldest part of the city we are centrally located and within easy reach of the cities main attractions.Our pleasant rooftop restaurant offers a splendid view of the magnificent Mehrangarh Fort, the royal family’s Cenotaphs, Gulab Sagar, the clock tower and the Old City. Heritage Guest House combines old charm with the best of modern amenities. Jodhpur - the Sun City is known for its grandeur & romance, its humble & warm hospitality. The unique way to experience this is with a stay at Royal Heritage Guest House. 2).24 hours check in time and check out before 11am. 3).We accept only cash payment upon arrival. Staying at Royal Heritage was the best decision that I made. It was definatelly the best and most welcoming place where I stayed during my 3 weeks in India. The staff was so nice, friendly and most helpful. The guest house has an amazing rooftop terrace with a view on the fortress and they are cooking amazing dishes as well. There how the rooftop terrace became my favourite place. And not only mine, with other guests as well as staff we spent there a lot of time together - family feeling! Really well located in the old city at walking distances to the fort and markets. Good staff and facilities. The rooftop view is awesome. There is also a restaurant there, a bit expensive for a backpacker budget. Its a guest house so if you look for hostel atmosphere this is not the place for you. Dorm is really cheap. Best place to stay in Jodhpur ! I enjoyed my stay at Royal Heritage Guesthouse. Affordable and strategically located. Hussain, the staff was amazing. He was helpful, kind and friendly. 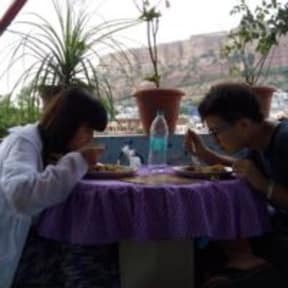 Being a solo female traveller, he ensured that I had a safe and pleasant stay in Jodhpur. I love the food at the rooftop cafe too. The view from the rooftop is beautiful as I can see the fort. Great value but even for the price somewhat indifferently cleaned. Wifi was good. Bed was comfortable. Geyser didn't work in my room at least. Restaurant was delicious and the rooftop has a great view of the fort. Do not stay here. No A/C. Staff barely spoke English so were unable to help us. Water was all over the floor in the rooms and around the hotel - maybe a leak? Our shower did not work at all! Stay away from these thieves! Our stay here was totally ruined by the lack of integrity these people had. The facilities were sub par, there were mice in our room, the room smelled of stale water, and the room was never cleaned. After extending our stay they did not honor the rates on website even though we prepaid they charged us 3x the amount! They also falsely advertised free breakfast, they charged us for every item. Horrible service, horrible hospitality. Do not book excursions either!